The Formentera Council's education department reports that this summer crews performed maintenance tasks and upgrades across the island's three public schools, or CEIPs (for “Early-learning and Primary Education Centre”)—Mestre Lluís Andreu and in Sant Ferran and la Mola—plus at the CEP, the local teachers' resource centre. Education secretary Susana Labrador pointed out that “every year the summer holiday is our chance to respond to requests from school administrations, parent/teacher associations and student body groups. It's how we managed to ensure proper maintenance in time for the start of classes this Wednesday”. At the lower Mestre Lluís Andreu building the Formentera Council maintenance brigade repainted exterior walls, hung tiles in the inner playground, cleaned the area around a boiler and painted and covered an existing metal structure to create a shaded area. An outside contractor grouted a leaky hallway, painted the school's right wing and performed touchups of the left wing for €5,047 total. The brigade carried out regular maintenance on the school's upper building, including painting a host of spaces inside and out. 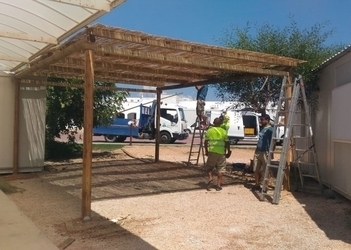 At the Sant Ferran school crews fashioned a new shaded area out of wood and wattle in the space that lies between the portable classrooms and the sport pitch. A new intercom was also installed and one classroom's leaky ceiling was fixed. Some work—including cleaning, removal of the previous coat of paint and application of a fresh one—was farmed out to outside firms at a cost of €9,922. Aside from conducting a general revision of the school's interior and exterior paint jobs, crews replaced the wooden parts of a spinning toy located outside, revised the window of the portable classroom and repaired the track of the sliding glass door with entry to the primary students' classroom. For €5,552 an outside firm was brought in to assemble two new air conditioners and instal five taps. Two outside firms were enlisted to reform the CEP's exterior woodwork and paint job, operations which cost €18,600. That work was in addition to earlier repairs of the historic building's tile roofing, rainwater harvesting system and façade. The total price tag for the maintenance and upgrades across Formentera's educational centres was approximately €40,000. The education secretary noted that “during the school term two crew members are responsible for attending to any maintenance needs that may arise at the island's three early-learning and primary schools”. Along with work at schools, crews also made use of the August holiday to conduct reforms of the bottom lobby of the Marià Villangómez library and music and dance school. Efforts included cleaning and repainting walls and switching out flooring at a cost of €9,000.